This illustrated text and reference emphasizes the fundamentals of hand therapy for both specialists and non-specialists who encounter clients with hand issues. It provides a consistent format with tips and guidelines for hand therapy treatment. Coverage includes hand anatomy, key terms and concepts, and the evaluation process. A focus on professional issues includes clients with functional somatic syndromes and challenging behavior, client-therapist rapport, and the roles of therapy assistants. Providing many case studies, this text helps therapists think critically about clients individual needs. Emphasizes the development of clinical reasoning skills, describing the components of the evaluation process and addressing how to decide what to evaluate. Covers a broad array of common diagnoses seen in hand therapy, including shoulder and elbow disorders, peripheral nerve problems, wrist and hand fractures, tendonitis and tendonosis, finger sprains and deformities, tendon injuries, arthritis, burns, infections, ganglion cysts, stiffness, Dupuytrens, and pediatric and geriatric hand problems. Diagnostic-specific information and treatment guidelines follow a consistent format: Overview Diagnosis and pathology Timelines and healing Anatomy Treatment (non-operative and/or operative) Questions to ask the doctor What to say to clients Evaluation tips Diagnosis-specific information that affects clinical reasoning Tips from the field Precautions and concerns Role of therapy assistants Case examples Offers topics to use as mental prompts when working in the clinical setting: Questions to ask the doctor What to say to clients Tips from the field Precautions and concerns Over 400 illustrations in the text and on the CD demonstrate important concepts. Case studies in the common diagnoses chapters demonstrate the use of clinical reasoning and highlight the human side of each client encounter. Clinical pearls and precautions share advice from the author and contributors, learned from years of clinical experience. Describes the role of the therapy assistant with the client, showing how the therapy assistant may be included in the therapy process. Glossary includes key terms from the text, offering easy access to definitions of key terms. 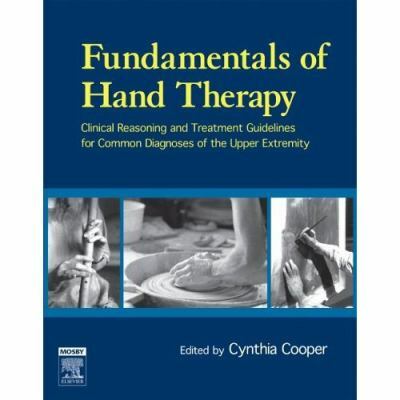 CD provides samples of hand therapy exercises and clinical forms that may be used with clients.Cooper, Cynthia is the author of 'Fundamentals of Hand Therapy Clinical Reasoning and Treatment Guidelines for Common Diagnoses of the Upper Extremity', published 2006 under ISBN 9780323033862 and ISBN 0323033865. Loading marketplace prices 13 copies from $30.99 How does the rental process work?